I am frequently asked how my Synology NAS arrays are attached to the network in my lab. The answer is simple: LACP (except for one array that has a single link). 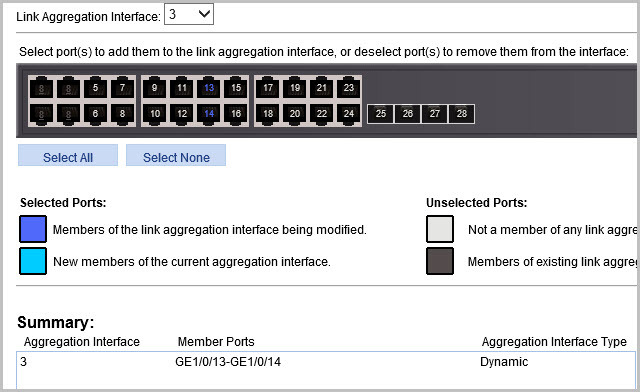 The reason behind this configuration is that LACP tends to distribute load across member links evenly so long as a healthy handful of sessions are running over them. In my case, that session list is made up of about 20 different clients spread among ESXi hosts (NFS), workstations (SMB), and virtualized servers that access the NAS directly (SMB and NFS). In this post, I’ll share the LACP configurations across my two lab switches – an HP V1910-24G and Cisco SG300-52 – for my three Synology NAS arrays that have a dynamic LAG (Link Aggregation Group) configured. I’ll warn you that each vendor has a variety of terms used here – BAGG, Bond, LAG, Port Channel, Channel Group – and I’ve tried to include them in the correct context for those following along with their own configurations. The HP switch is not very fun to configure via SSH, so I lean towards the GUI (which likes IE more than Chrome, it seems). I’m also much more comfortable with a Cisco IOS-like command structure, and the comware CLI is sad panda. There’s only one storage LAG (BAGG or Bridge Aggregation) configured on the switch for an array called NAS3, which is a Synology DS414slim. Note: If you want a video walkthrough on creating a dynamic LAG on an HP switch, check out this video (and just ignore the vSphere parts). The Cisco configuration is pretty basic and, unlike the HP switch, I prefer to use SSH over the GUI. Each switchport and port channel has a description with the NAS name, and I try to make the port channel ID match the NAS number. 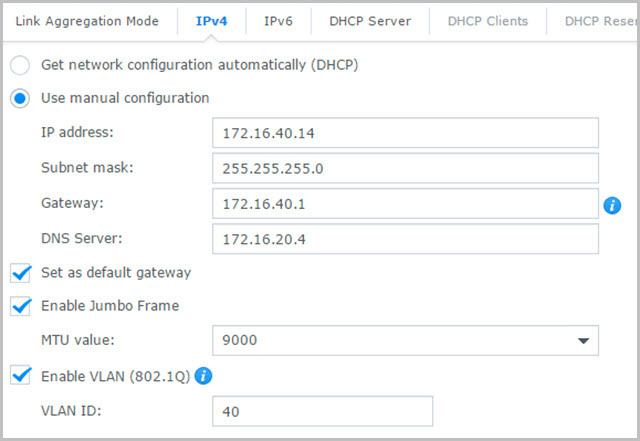 Here’s an example of my port channel configuration for NAS4, which is an ioSafe 1513+. 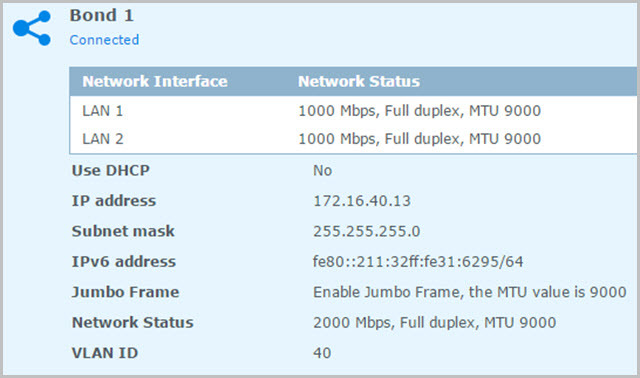 There’s another array attached to the Cisco switch called NAS2 which is a Synology DS2411+. Pretty much the same config, but less links. Pretty simple, right? Let me know if there are questions or I can provide some more details on the configurations. Have you looked into running multiple VLANs on the Synology boxes? I find it irritating that they don’t support multiple VLANs in DSM (web gui). I haven’t really tested from CLI. 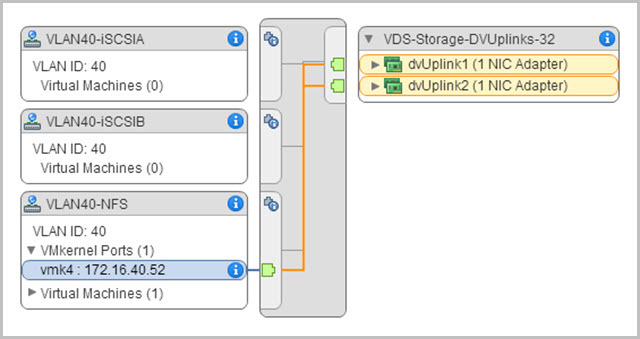 What I would like to do is have a seperate VLAN for iSCSI and/or NFS that are for ESXi storage … to get the lab environment to be even more like a production environment..
Any thoughs or links to such a (manual?) setup? 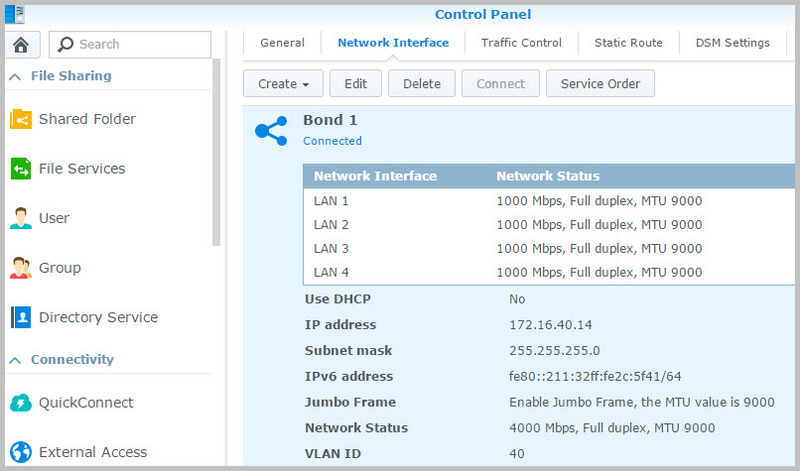 You can have one VLAN per network adapter, but not more than that. I wanted to run iSCSI over a different VLAN too, but after spending a few hours on it, I gave up. Not possible. 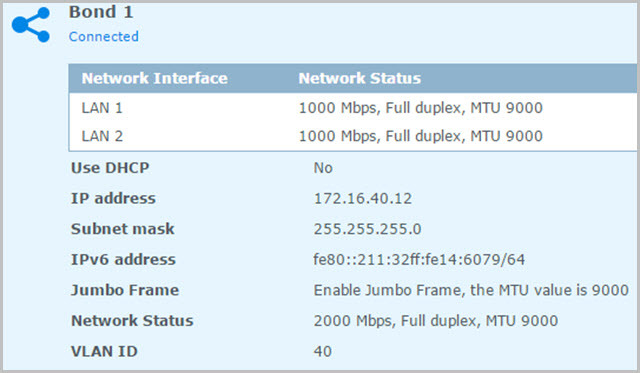 Do you have a speed test of before and after the Dynamic LACP configuration ? Do you have all the interfaces per Diskstation in one switch, or do you spread it out across both your switches for redundancy? If you have it across both switches, would you need a LAG in each switch per diskstation? I connect each NAS to one switch. If I did use both switches, then yes – the supported method would be to split the interfaces between the two switches, create a LAG for each switch, and assign an IP address to each LAG. Hi Chris! I am currently in the process of considering switching from iSCSI to NFS on my Synology box. Quick question: what did you use for your NIC teaming policy on the NFS port group (e.g. route on the physical NIC load, MAC hash, or something else)? I guess I’m still a bit confused on how to set up the network the right way since I’m coming from iSCSI where multipathing seemed more straightforward. I would just go right for NFS 4.1 since I’m on vSphere 6, but Synology still doesn’t have the support for it. Thanks! The defaults will work fine – both uplinks are Active and the teaming policy is routing based on originating virtual port. The hypervisor will select an available, active port and use it until a failure occurs. I know you are not a fan of iSCSI but can you connect the Synology boxes the same way with dynamic LAGs if you were to use iSCSI MPIO? I know this is a no go on the ESXi host end but I guess I’m a bit confused on how to set the NICs up on the NAS end, whether LAGs are still okay, if you should break the ports into multiple subnets like other vendors recommend, or something else.